← Is There Any Biblical Evidence for the Rapture? The default mode of the human heart is to replace our central focus on God and replace this void with idols at the center of our lives. The prolific author and Theologian D.A. Carson has stated it this way, “Whenever the periphery is in danger of displacing the center, we are not far removed from idolatry.” I believe that to ask the question, “Is the Bible Sexist, Racist, Homophobic, and Genocidal?” – is at its core a misunderstanding of what’s at the center of our worship – God or self? Are we going to maintain a God-centered focus or capitulate to cultural relativism with ourselves at the center? In this important e-single from a chapter in Morrow’s larger book entitled “Questioning the Bible” Morrow tackles this question with theological precision, biblical erudition, and logical acumen. Morrow opens this essay by dealing with the question: “Does the Bible endorse slavery?” He then answers this question by carefully developing five biblical responses: (1) Christianity did not invent slavery. (2) He shows how the ancient Near Eastern cultural context was very different from the modern postcolonial context. (3) Christianity tolerated slavery and was instrumental in its abolishment. (4) Jesus was not silent on slavery; he simply understood what the root issues were–and they all reside in the human heart. (5) The Christian worldview best accounts for human rights and dignity. 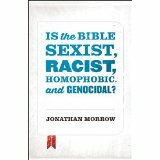 The second question addressed by Morrow is “Does the Bible approve of genocide?” In five points Morrow sets the record straight in understanding the biblical stance on genocide: (1) Things are not the way they ought to be – Israel as described in the Old Testament is not God’s ideal society. (2) The divinely given command to Israel of herem (Yahweh War) concerning the Canaanites was unique, geographically and temporally limited, and not to be repeated. (3) Genocide and ethnic cleansing are inaccurate terms for the conquest of Canaan. (4) We must allow for the possibility of rhetorical generalization in ancient Near Eastern “war language.” (5) The Canaanite incident should be read against the backdrop of God’s promise of blessing for all the nations. I am a self-published author of three books which based on your profile, I believe may be of interest to you. Should you be able to find the time in your busy schedule, I would appreciate your candid review of “Preaching that Empowers God’s People: Expository Preaching in the 21st Century”, “The Minister’s Handbook: A Guide for Leadership” and “Conducting Church Audits: A Guide for Internal Auditors.” I am willing to send you free copies for your review if you would be kind enough to reply with the titles and your mailing address.